While we all love to experiment in the kitchen, every cook has their favourite ingredients they use again and again in their meals. My usual suspects include garlic, chilli sauce, cream cheese and that Great British favourite, Worcestershire sauce. I love the way Worcestershire sauce gives a comfortingly rich yet suitably spicy note to all your family staples. It makes a regular appearance in our cottage pies, casseroles and Bolognese sauces. But this is the first time I’ve tried it in a broth and it didn’t disappoint. 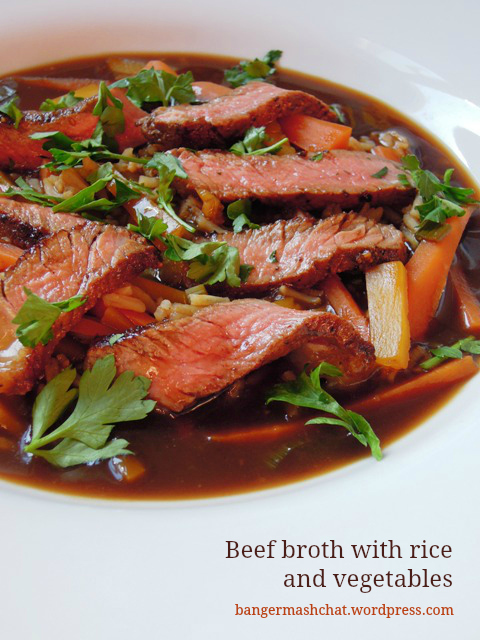 Together with the soy sauce and beef stock, it creates a gorgeous, deeply meaty broth, just perfect with the tender slices of beef steak, crunchy vegetables and soft rice. This dish was a winner with all the family, although I suspect my husband felt it would benefit from the addition of a little sliced chilli, but then he thinks that about most things I serve up. And it also tasted very good the next day when I heated up a pot in the office microwave for my lunch. Heat a large frying pan. Brush the steak with a little vegetable oil and season with black pepper. Fry over a high heat for around 3 minutes on each side, shaking over a few drops of Worcestershire sauce as it cooks. Leave to rest on a warm plate. Pour the stock into a large saucepan and heat. Add 2 tablespoons of Worcestershire sauce and one of soy sauce, and throw in the spring onions, garlic, carrot, butternut squash and rice. Bring to a simmer, cover and cook gently for around 10 minutes. Divide the broth between 4 bowls. 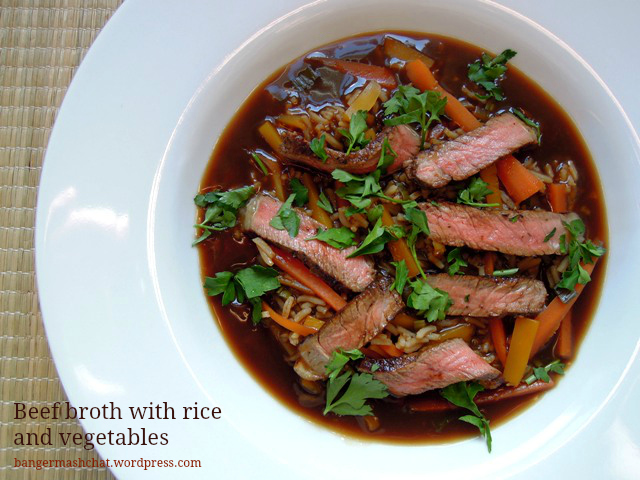 Thinly slice the steak and place on top of the broth. Garnish with chopped parsley and serve immediately. If you’d like some more ideas on how to use Worcestershire sauce in your cookery, you should take a look at Lea & Perrins’ YouTube channel. They have created a series of recipe videos with British YouTubers Sorted Food, bringing all kinds of twists to classic family dishes, such as spaghetti Bolognese and cheese on toast. Disclosure: This post is sponsored by Lea & Perrins. This looks so tasty. My husband would also like a few chillies sliced in his as he also thinks everything tastes better with chillies! I love worcester sauce in cottage pies and also in slow cooker recipes at the moment. That looks really tasty. I love the colours of the vegetables. Gorgeous photo! 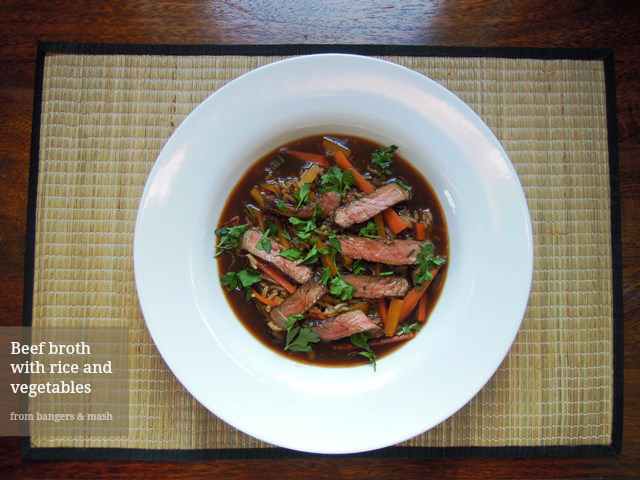 This sounds lovely, Worcestershire sauce is one of my store cupboard heroes, it’s so useful!